Israel's Defence Minister Ehud Barak has given the country's military one month to prepare to conscript ultra-Orthodox Jewish seminary students, after a law exempting them expired. In February, the Supreme Court ruled that the Tal Law, which allowed them to defer military service, was unconstitutional and that a revised law should be drafted by the end of July. However, the main political parties in parliament failed to reach agreement. Secular Israelis say the law is unfair. Now that the Tal Law has expired, conscription is in theory governed by legislation - passed in 1949 and last amended in 1986 - that requires all Israelis above 18 years of age to enlist, unless specifically exempted by the defence ministry. Mr Barak had instructed the Israel Defence Forces (IDF) to draw up a "practical proposal" on how to implement the 1949 law within a month, according to a statement by his office. The proposal "will reflect and take into consideration the ruling of the High Court of Justice, the requirements and values of the IDF, the principle of sharing the burden of national service more equally, and the suitability of individuals for service, as is commonly accepted", the statement said. 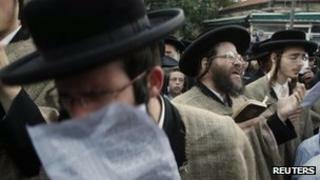 It is widely expected that until it is ready, no steps with be taken to conscript any ultra-Orthodox. The temporary solution is to remain in place until parliament agrees on a new law, according to Mr Barak's office. Prime Minister Benjamin Netanyahu denied the expiry of the law had caused a problem, insisting that the army would immediately begin widening its list of recruits. "There is no vacuum, there is no vacuum, there is a law," he told Israeli TV. "There's a new law about equal service. The Israeli military will decide whom to draft, how many to draft - and it will draft. I will give it all my support." Ultra-Orthodox leader Meir Porush, a former Knesset member, told the Associated Press that any attempt to conscript members of his community would unleash "civil war", but added that the army was itself unlikely to want religious conscripts. "The Israeli military is not ready, won't be ready and doesn't want to be ready," he added. Last month, the centrist Kadima party left Mr Netanyahu's coalition government after rejecting his right-wing Likud Party's proposals to replace the Tal Law. Mr Netanyahu is reported to have said that 50% of ultra-Orthodox Jews between the ages of 18 and 23 would be drafted by the IDF and another 50% would be drafted into operational civil service between the ages of 23 and 26. Religious parties in his coalition also threatened to quit if the exemption was abolished.